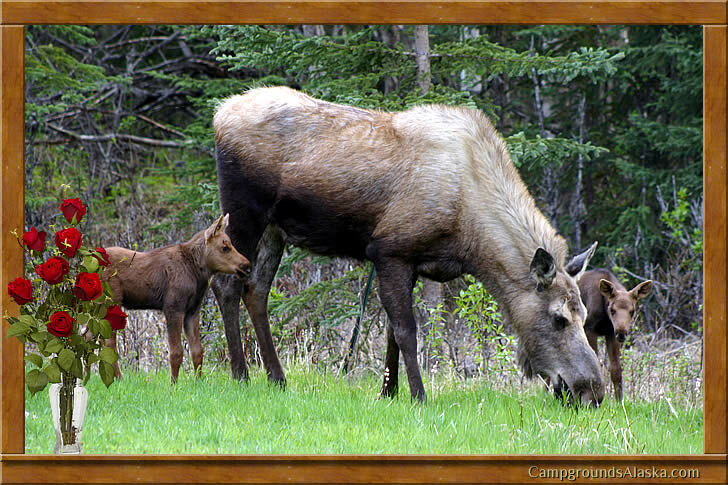 Campgrounds in Moose Pass Alaska and around the immediate area. Moose Pass Alaska is located on the Kenai Peninsula between Kenai Lake and Seward AK. This small town has an excellent restaurant and lodge that is well worth your time to visit. The town sits on the shores of Upper Trail Lake in a picturesque setting of mountains and valleys. More than just a stop along the road to Seward, Moose Pass has become a destination in itself with Alaskans heading into the backwoods of the Kenai Peninsula. A town of some 200 year round residents, this mountain village is a main stop of the land portion of many cruise tours beginning or ending in the seaside town of Seward AK. Moose Pass makes for a very convenient base for a variety of hiking, camping, photography and outdoor activities. Snowmobiling in the winter is a very popular activity in the area with access to the many glaciers of the Chugach mountain range. For two days every June, the community of Moose Pass as well as many Alaskans from around the state come together for food, games, music and lots of good ole family fun. The Moose Pass Summer Solstice Festival is an annual event held to raise additional money for the Moose Pass Sportsman’s Club. Fishing and hiking dominate the activities in and around Moose Pass. Popular trails include Primrose Trail, Carter Lake Trail, Devil's Pass Trail, Johnson Pass Trail, Lost Lake Trail, and Ptarmigan Creek Trail are all close to Moose Pass making this town the perfect bace camp for all these adventures. Camping in the Moose Pass area includes a number of small and large federal and state campgrounds including many that have been upgraded in recent years. There are also a couple area used throughout the year by hikers and snowmobilers that offer an option to the normal campsite. Primrose and Trail River are two of the most well known but a number of others are close by too.